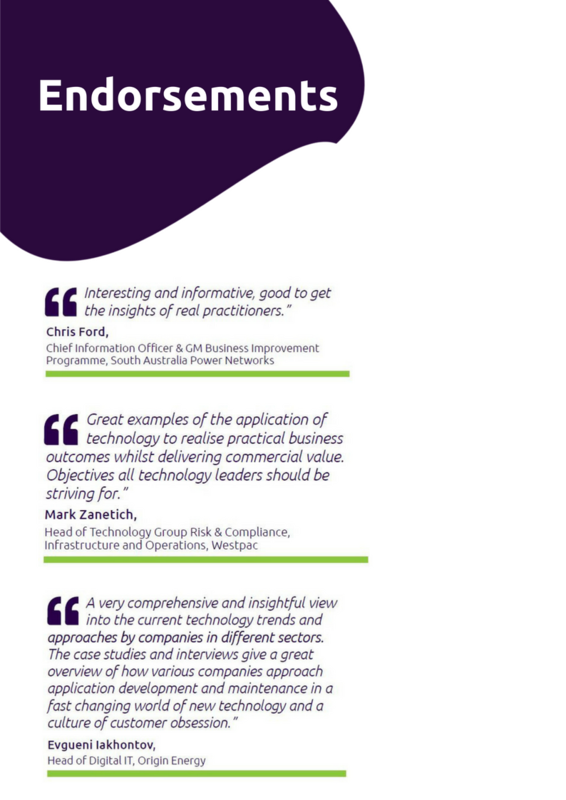 Now in its 4th edition, the 2018 edition of Executive Insights on modern and integrated Application Development and Application Maintenance captures the insights from Capgemini practitioners and 11 in-depth interviews from IT leaders in Australia and New Zealand. The publication explores two dimensions. The first dimension is an overview analysis of industry sectors, followed by interviews with IT leaders within those sectors. The second dimension is an analysis of multiple ADM focus areas that permeate across the industry sectors and manifest themselves in ADM engagements. Some of the focus areas explored are Agile & DevOps, AI, automation, Cloud, cybersecurity, IoT, microservices and APIs. This is reflective of the reality of modern and integrated ADM where innovation can come from anywhere and everywhere and where viewing ADM from a keeping the lights on lens is misplaced since business capabilities contribute decisively to the competitiveness of the organisation – to elevate customer experience and to grow market share. Interested to find out more? Complete the form to receive the full report.